Rome was growing and quite wealthy after the Punic Wars, but the republic faced serious problems. Many Roman politicians took bribes and often encouraged violent mobs to help them rise to power. Soldiers returning home from years at war could not find work because rich landowners used slaves to do the work once done by poor Romans. The republic also became embroiled in several civil wars. A civil war is a war within a nation. Many Romans wanted a strong leader, and the ambitious Julius Caesar was an obvious choice. 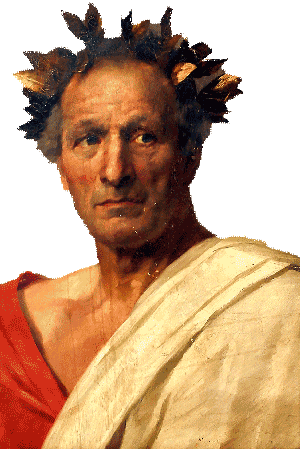 Gaius Julius Caesar was a patrician and popular general when he was first elected consul in 59BCE. Marcus Biblius was Caesar’s co-consul, but Caesar paid no attention to the wishes of Biblius and the Senate. Caesar ordered the redistribution of lands to the poor, a decision that made him very popular with the Roman people but angered many wealthy landowning senators. Biblius attempted to veto Caesar’s act, but Caesar’s mob attacked the co-consul. The terrified Biblius retired to his home and left Caesar in control of the Roman government. The Senate tried to block Caesar’s decisions, so he formed a partnership with his former enemies, Crassus and Pompey. Historians often refer to this alliance as the First Triumvirate. A triumvirate is a partnership of three equal rulers. Neither Crassus nor Pompey were consuls, but the three generals were so popular with the Roman people that they were able to ignore the wishes of the Senate. 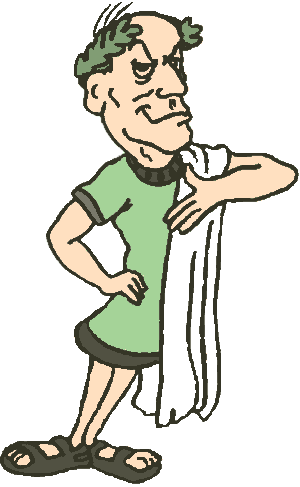 Under Roman law, an official could not be arrested while he was in power. Knowing the Senate would have him jailed as soon as he left the consulship, Caesar arranged to be appointed as governor of a Roman province in Gaul. Gaul was a territory northwest of the Italian peninsula. Upon taking office in Gaul, Caesar used his personal fortune to raise a private army. For the next nine years, Caesar led his troops across western Europe, killing or enslaving millions and conquering lands that added to the Roman Republic. In 49BCE, the Senate ordered Caesar to disband his personal army and to return to Rome as a private citizen. Caesar once again feared arrest, so he ignored the order and marched his army back to Rome. Caesar’s orders clearly told him not to bring his troops across the Rubicon River. When Caesar reached the river, he knew he faced an important decision. Caesar knew that if he obeyed the Senate and disbanded his army, his career would be over; but if he marched his troops across the river, the Senate would order Pompey and his army to retaliate. Today when people say they are “crossing the Rubicon,” they refer to a very significant decision that cannot be undone. As Caesar’s army approached Rome, many frightened senators fled the city. Pompey announced that “Rome cannot be defended,” and retreated south with his army. The remaining senators named Caesar dictator. For the next several months, Caesar and his army pursued Pompey throughout the Mediterranean until Pompey led his army to Egypt. When Caesar arrived in Egypt, he met Ptolemy XIII, the ten-year-old ruler of the ancient land. Hoping to gain favor with Rome, Ptolemy presented Caesar with Pompey’s decapitated head. 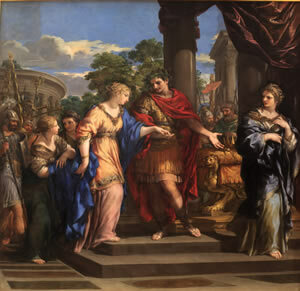 Caesar then met and fell in love with Cleopatra, the older sister of Ptolemy XIII. Caesar spent a year with Cleopatra, and then returned to Rome as a conquering hero. The Senate elected, then re-elected Caesar consul, breaking the Roman tradition that a consul serve only one year. While in power, Caesar settled 80,000 of his soldiers in colonies, built buildings and monuments throughout the city, and reformed the calendar. When Caesar came to power, the calendar was out of alignment with the seasons. Caesar instituted the Julian calendar of 365¼ days. Caesar added a month to the calendar and named it July for himself. Caesar’s calendar is closely related to the calendar we use today. In 44BCE, Caesar arranged to be named dictator for life. A dictator is a ruler with complete control. The Senate had appointed dictators in the past, but only in great emergencies and for a period of no more than six months. Caesar ignored the Senate and ruled without their consent. Many Senators became enraged because Caesar broke with Roman tradition and behaved as if he were a king. 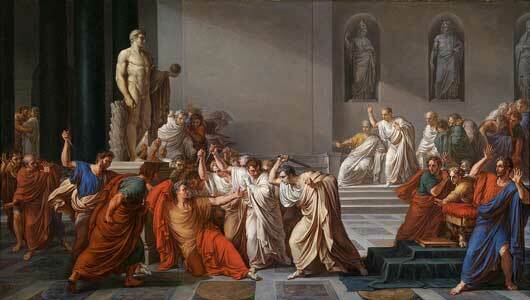 On March 15, 44BCE, a mob of sixty senators stabbed the dictator to death in the Roman Forum. Ironically, Caesar fell to his death at the foot of a statue of Pompey, the general who Caesar defeated. With Caesar dead, Rome fell into a period of civil wars that would lead to the end of the Roman Republic and the creation of the first Roman Emperor. History remembers Julius Caesar, but it would be a mistake to look at that famous name as if it were that of a 21st century American. Caesar was not the dictator’s family name. Elite Romans of the late Republic had three or four names: a praenomen, nomen, cognomen and occasionally an agnomen. The praenomen was the personal name chosen by the father. The praenomen of Julius Caesar was Gaius. The nomen was the family name, equivalent to the surname in English speaking nations. In the Julian family, males would be Julius and females Julia. The cognomen was the name within a branch of a family. Historians are uncertain what Caesar might have meant. A similar word meant “hairy” in Latin, an ironic choice for the balding dictator. The agnomen was a name that distinguished a person from others with the same name. The Roman hero of the Punic Wars was Publius Cornelius Scipio Africanus. The names of his family shared the first three names. The Roman people added the agnomen Africanus in recognition of Scipio’s defeat of Hannibal in 202BCE. His brother—also a celebrated general—was Publius Cornelius Scipio Asiaticus. Today it is common to add a generational title to someone who shares a name with a father or son. Martin Luther King, Jr. distinguished the civil rights leader from his father. Not all people have a family name. In some cultures, people are known only by a mononym, or single name. Suharto was president of Indonesia from 1967 to 1998. Most nations identify their family name as a surname. Barack Obama is a member of the Obama family. In some nations, including China, Japan, Vietnam, Korea and Hungary, identify the family name first. The forty-fourth president might be known as Obama Barack in those nations. Hispanic names often identify the family names of both parents. Novelist Gabriel García Márquez was the son of Gabriel García and Luisa Márquez. His full name was Gabriel José de la Concordia García Márquez. His friends and readers called him Gabo. The Greek historian Plutarch recounts an incident that may tell us much about the character of Julius Caesar. Around 75BCE, Caesar was returning home by sea from a visit when he was captured by pirates. The pirates told Caesar that they would ransom him to his family for a fee of twenty talons—about 1140 pounds or $350,000. Caesar told his captors that he was far too important to be ransomed for that amount. He insisted the pirates demand fifty talons. Caesar remained a captive for the next thirty-eight days in their base off the coast of Cilicia in modern-day Turkey. The young Caesar treated the pirates with disdain and contempt. Caesar composed poetry and speeches for the pirates. If they failed to admire his talent, he would scold his captors as illiterate savages. Caesar took part in their games—usually beating them. Occasionally Caesar would joke with the pirates that he would come back one day to crucify them all. The pirates were amused by Caesar’s taunts, and they grew to like and respect the brash young man. The pirates released Caesar when his family paid his ransom. Caesar then raised a fleet of ships and returned to the island. He captured the pirates, reclaimed his fifty talons and took all of their possessions. Caesar approached the praetor in charge of the province, demanding that the pirates be executed for their crime. The praetor wanted to sell their pirates as slaves and keep the profit for himself, so Caesar acted on his own. Caesar had the pirates crucified, just as he promised when joking with them as their captive. The Caesar salad was named not for the Roman dictator but for Cesare Cardini, an Italian immigrant who ran restaurants on both sides of the United States – Mexico border. According to Cardini’s family, the restaurateur created the Caesar salad from what was left in his kitchen after a particularly brisk day of business on the Fourth of July, 1924. Not only is the Caesar salad not Roman, it was created on America’s birthday!